© Women's March on the Pentagon. 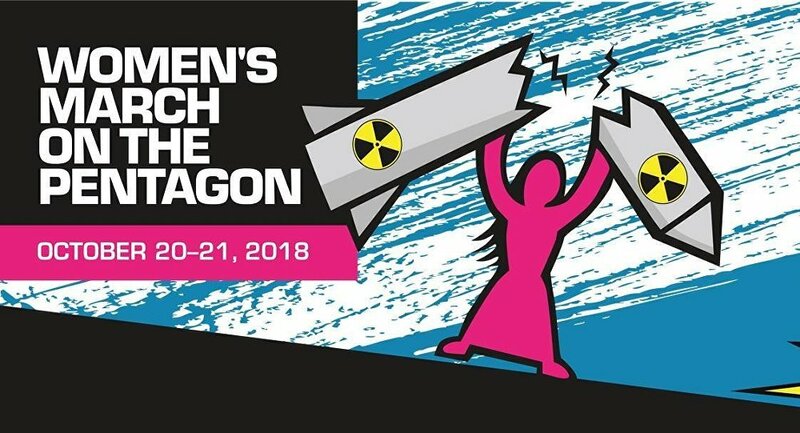 Fifty-one years after the historic March on the Pentagon in 1967, which many credit as a turning point in the anti-war movement that eventually played a part in the US pulling out from Vietnam, women and allies are planning another march to the Department of Defense headquarters in a bid to mainstream the movement again. Organized by the National Mobilization Committee to End the War in Vietnam, the 1967 protest brought an estimated 70,000 participants out into the streets. They began with speeches at the Lincoln Memorial in downtown DC and marched over the Arlington Memorial Bridge to the Pentagon, where they were greeted by military police wielding bayonets. Some 650 people were arrested for civil disobedience on the steps of the building. A news report on the protest published by Universal Pictures said that "today's protest ends with over 600 arrested and the widespread opinion that the demonstration made everyone a loser." Today, the parent company of Universal Pictures is NBC Universal, and both of them, along with their sister company MSNBC, are owned by Comcast. The upcoming Women's March on the Pentagon was organized in part by anti-war activist Cindy Sheehan, whose son Casey Sheehan, a US Army Specialist, was killed in 2004 during the early years of the Iraq War. On "April 4, 2004, my son Casey Sheehan was in the US military in the 1st Cavalry, and he was just barely in Iraq for a week, and he was killed in combat," Sheehan told Radio Sputnik's Loud & Clear. "He was promised by his recruiter that he would never see combat." "I hear that's a very common lie that recruiters tell our young people," Sheehan added. "We were against the war before. After Casey was killed, I was fired from my job because I had to take too much time off," Sheehan said. "That was kind of a good thing that I got fired, because then I was able to reach out and make connections." "By August 2005, we had started a peace camp in front of [President George W. Bush's] Crawford, Texas ranch." Sheehan was told that she had reignited the anti-war movement, she told Loud & Clear hosts John Kiriakou and Brian Becker. But after "the Democrats came back into power in ‘06… and they took control of the House of Representatives, with Nancy Pelosi being the house speaker — that's when the movement really started to tank, and with the  election of [President Barack] Obama," Sheehan said. "And [during] Obama's spread of imperialism to at least six or seven more countries than Bush was even in, the movement was kind of dormant." "The anti-war movement, I found out, was more anti-Bush than anti-war." Sheehan and co-organizer Bonnie Caracciolo "have been very strict" with their messaging regarding the Women's March on the Pentagon, Sheehan said. "We're saying this is not an anti-Trump thing, this is an anti-US militarism thing, this is an anti-imperial thing. We're against the war machine, no matter who's in charge of it." Organizers hope to raise awareness about conflicts like those in Gaza, Yemen and elsewhere. They also highlight the devastating impact to the environment caused by war and the military-industrial complex at large. "We believe that the military budget in the United States is obscene. What it does is obscene," Caracciolo said. "We're currently looking at 60 cents of every dollar of our budget — our collective budget — goes to the military." You can tune in to Sputnik News' livestream of the protest on Facebook on October 21 at 1p.m. EST.